Building things is not only educational, it's great fun! Your little ones will be entertained for hours when they use blocks, shapes, logs and more to create their own structures. Brilliant Builders - 230 Pieces ONLY $15.99! Make structures big enough to sit in or as small as a shoebox. Set includes 130 8-inch bending straws and 100 connectors in 5 colors. Activity guide included! Thistle Blocks - 108 Pieces for ONLY $24.74! 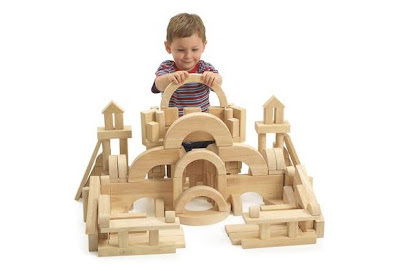 Squares, rectangles, triangles, wheels and axles easily connect for building everything from the most simple construction projects to the most complex. 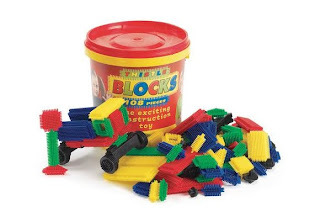 Blocks come in a handy plastic storage bucket and includes 11 different shapes and sizes. Frontier Building Set - 160 Pcs. ONLY $24.95! 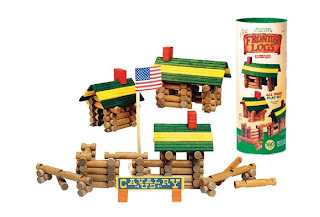 Welcome to the frontier with this 160-piece set of interlocking building logs. Made of real wood with a non-toxic finish, this set includes logs of differing lengths and wooden slats to create rooftops and chimneys. Guaranteed to stimulate and challenge the imagination of every child! The prices here keep falling, but there's no hardhat required for these cool construction sets! 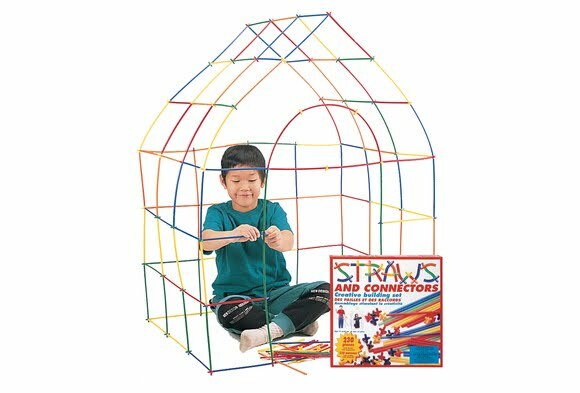 Find more great building sets at great prices when you shop Discount School Supply today. Teachers, caregivers, dads and moms: shop Discount School Supply and save on Arts and Crafts, Furniture, Manipulatives, Active Play, Dramatic Play, Curriculum Resources and more! Set up your construction zone today when you shop Discount School Supply. Great building supplies at affordable prices only at Discount School Supply! BioColor® is so amazingly versatile, you'll think it's magic! Review: "This is my first purchase. I have never had to watch a DVD with my paint. But, after watching it, I think this is the coolest paint. Besides the fact that there are a large variety of colors, the colors are shiny and bright; you can even make putty out of it. My kids loved painting on the window, and I loved the clean up. 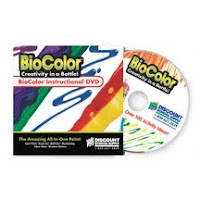 As I run out, I will definitely be purchasing more of BioColor® paint. Who knew paint could be this FUN and VERSATILE!" BioColor® does it all! It spreads and adheres easily to paper, plastic, wood, metal, cardboard. It shines brilliantly when dry and won't crack or fade with age! Use for fabric painting, sticker art and marbling projects, or make multi-colored putty! 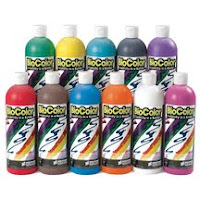 BioColor® is also great for resist art, slick surface painting, scraper art, "paintsicles" and blotter art. This set of all 11 original colors includes: black, blue, brown, green, magenta, orange, red, turquoise, violet, white and yellow. Gold, silver and fluorescent colors are also available. BioColor® washes off skin with ease, is non-toxic, AP Certified and carries the prestigious AP Seal from the ACMI (Art & Creative Materials Institute). The bottles are also recyclable! Click here for more project ideas using BioColor®! With the 25th Anniversary celebrations in full swing at Discount School Supply, it's only fitting that we offer 25 Discount School Supply Best Sellers for 25% OFF. Colorations® Best Value Unscented Dough - 10 lbs. ONLY $19.49! Foam Unit Floor Blocks - 126 Pieces ONLY $74.00! Super Classroom Sand Set - 34 Pieces ONLY $27.99! Colorations® Simply Washable Tempera Paint, Gallon ONLY $7.49! Deluxe Marble Race - 90 Pieces ONLY $19.11! Best Value Bead Bucket ONLY $17.24! Dressing Boards - Set of 6 ONLY $22.34! Large Colorations® Washable Glue Sticks in a Tray, 0.88 oz. Each - Set of 12 ONLY $5.61! Colorations® Best Value Plastic Handle Paint Brushes - Set of 30 ONLY $11.24! Sport Ball Hoppers - Set of 3 ONLY $21.36! Rhinestones Super Pack - 2,000 Pieces ONLY $11.99! Acrylic Scary Bug Specimens - Set of 4 ONLY $22.49! Shapes Walking Rope ONLY $16.46! Letter Sorting Box - 105 Pieces ONLY $22.46! Colorations® IncredibleFoam® Classroom Pack ONLY $26.99! Colorations® Regular Crayons - Set of 800 ONLY $22.49! Germ-Free Baby Changer ONLY $36.99! Infant Photo Cubes with Mirror - Set of 3 ONLY $21.71! Rhythm Band O NLY $24.71! Dinner Set - 22 Pieces ONLY $11.24! 6' Brawny Tough Rainbow Parachute ONLY $10.46! Rainbow Feathers Classroom Pack - 8 oz. ONLY $8.24! Classroom Calendar & Weather Center - English ONLY $29.99! Colorations® 5" Blunt Tip Scissors - Set of 12 ONLY $7.46! Colorations® Stamper-Perfect Washable Stamp Pads - Set of 12 ONLY $14.99! Wow! 25% OFF the 25 products above is a fantastic deal! This is 25% savings in addition to the already 110% Lowest Price Guarantee that you will find exclusively at Discount School Supply. Moms, dads, teachers and caregivers: celebrate 25 years of Discount School Supply with incredible savings on our best sellers. But you have to act now! This sale ends August 19th! At Discount School Supply, we specialize in top quality early educational materials at the most affordable prices. Discount School Supply boasts the best deals on Arts and Crafts, Furniture, Manipulatives, Active Play, Dramatic Play, Curriculum Resources and other great stuff for early childhood learning centers and homes. You can even find great deals on top quality Special Needs resources as well as educational tools for Infants & Toddlers. 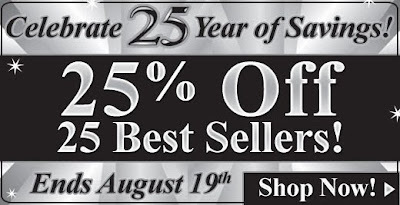 So shop Discount School Supply today and celebrate 25 years with 25% OFF 25 Best Sellers. Click here for more! Royal Seating™ features tables and chairs fit for your littlest kings and queens. And at great Discount School Supply prices, you don't have to be royalty to afford them! 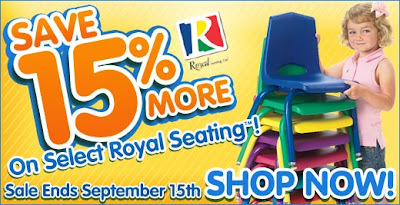 And, for a limited time, you can SAVE 15% MORE on Royal Seating™ when you shop at Discount School Supply! 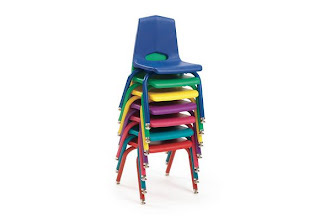 10" Quantum V-Back Plastic Stacking Chair with Matching Legs ONLY $20.35! These stylish chairs are strong, stable and easy to stack! Ergonomic design promotes correct seating posture. Classroom color coordination is easy - matching Prima Color Banded Tables are available (sold separately). Stack up to 10 to 12 chairs high. Plus a 25-year limited warranty! 48" Round Adjustable Prima Table ONLY $165.63! This rectangle Prima table manufactured by Royal Seating™ combines value, color and durability all in one piece of furniture. It adjusts from 15" to 23" or 19" to 30". Table top is 3/4" banded laminate with black vinyl t-mold banding and patented quick-mount legs. Minor assembly required. This table also features a 25-year limited warranty. Teachers and caregivers of young children: if you need new tables and chairs for your learning center, now is the time to jump out of your chair and take advantage of this amazing deal. Stock up for back to school and save 15% more on select Royal Seating™ tables and chairs. This deal only lasts until September 15th so you have to act now. Click here to shop today! And don't forget, Discount School Supply always offers the 110% Lowest Price Guarantee on top quality early education supplies perfect for back to school: Arts and Crafts, Furniture, Curriculum Resources, Manipulatives, Active Play, Dramatic Play and more! Shop Discount School Supply today! Early learners will delight in this set of 26 giant lace and learn cards! Comment: "All my children love these!" Review: "All of my 7 children play with these cards. 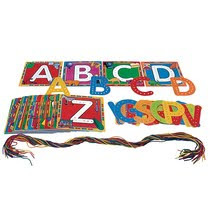 I primarily purchased them for my 2, 4 and 6 year old to learn and reinforce letter recognition and phonics during homeschool. After lacing them, my children stand up, say the letter laced, the sound it makes and say the word names of the pictures on the card. I am pleased to see how well my 4 and 6 year old are learning and retaining the phonograms with this fun activity. The others are just having fun!" Alphabet Lace-Ups are durable enough to last for generations of students. Each easy-clean plastic card measures 8 1/2"Sq. and features appealing bright pictures of words that start with the letter to be laced. Plastic letters are 6 1/2" tall with holes to match the card they belong to. Set includes 26 rainbow colored laces, each 44"L. Ages 3 years and up. What's a synonym for DROP? How about "fall," or "plunge?" Yes, these all work to describe the hottest deals at Discount School Supply because right now there are over 100 new plunging cool price drops at Discount School Supply! Color yourself happy with savings because the price of the Crayola® Washable Marker Classpack® - Set of 192 just fell! Now for only $66.88, this Crayola® Washable Marker Classpack® combines great value and versatility! The innovative packaging contains 6 plastic bins filled with 4 time-saving pre-assorted sets of 8 classic marker colors: black, blue, brown, green, orange, red, violet, and yellow. The bins make it easy to organize and can be easily collected and stored in the reusable, sturdy case. Count on extra money in your pocket because the price for the Pretend & Play™ Cash Register has gone down! For only $26.95, this cash register will let children learn basic calculator skills with oversized buttons and a big number display. It comes complete with life-sized play money, plastic coins, pretend credit cards and activity guide! For shimmery savings, the price of Colorations® Extra-Safe Plastic Glitter - 1lb. just plunged! Add some glitz to your designs with our extra-safe plastic glitter. Plastic glitter doesn't fade or tarnish and is glass and metal free. This glitter has greater volume than metal glitter. More for your money! Choose black, blue, gold, green, multi, orange, pink, red, silver, turquoise, violet or white. Find more falling prices with new price drops at Discount School Supply. 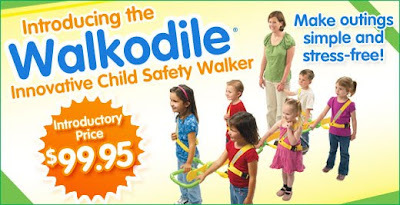 Be sure to check out hundreds of new deals on great items for any early childhood education classroom. 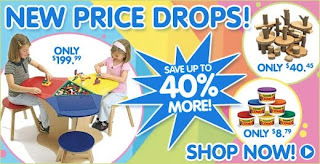 Moms, dads, teachers and caregivers, as those summer temperatures rise, remember that you will find the coolest, lowest prices guaranteed on Arts and Crafts, Manipulatives, Furniture, Curriculum Resources, Active/Dramatic Play items and more early childhood educational materials exclusively at Discount School Supply! If you want to take full advantage of the new falling, plunging price drops then be sure to shop Discount School Supply today! These drops won't fall forever! Decorate Your Own Papier-Mache Treasure Chests - Set of 12 is a craft project that kids will treasure! Check out this review of the Decorate Your Own Papier-Mache Treasure Chests - Set of 12 from Kathy in Millsboro, DE. Kathy is a satisfied Discount School Supply customer and she uses several Discount School Supply products for summer camp crafts. Review: "These chests were a huge hit at kid's camp. Ages 7 through 11 all loved them. The kids used sharpie markers and stick on jewels (also from DSS and a great product) to decorate. The markers did not bleed or run through. The boys were kind of rough with them while decorating and the boxes held up great! Great value especially for the reasonable price. The size was perfect. I had 172 kids this year at camp and they all loved the treasure chests. I shopped other online sites for comparable products but the size and price did not match up with the low price offered at DSS. Shipping was immediate. I had the product 2 days after ordering. Very Satisfied and will order again." 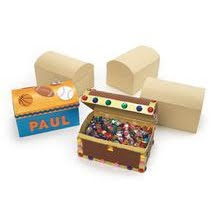 Decorate Your Own Papier-Mache Treasure Chests - Set of 12 can be decorated with paint, collage, glitter glue and more. Each sturdy, natural brown cardboard chest measures a substantial 5-3/4"L x 3-3/4"H x 3-7/8"D and includes hinge opening and real metal clasp to keep treasures secure. Good things come to those that wait. Patience is a virtue. If you prescribe to any of the above theories, then you are in for something special from Discount School Supply: Extreme Bargains! Yes, Extreme Bargains are back at Discount School Supply. For a limited time, save over 50% off retail on hundreds of early education items! Colorations® Simply Washable Tempera Paint - 16 oz. ONLY $1.69! 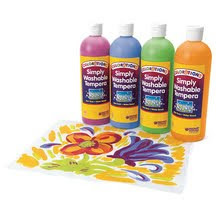 Discount School Supply's exclusive tempera is washable and comes off skin and clothing easily. It's also smooth and more opaque competitors' products. Choose from blue, green, orange, pink, purple, red and yellow. 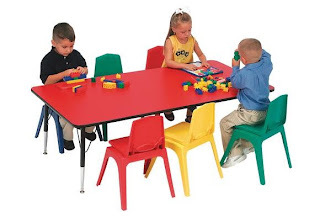 10" Quantum V-Back Plastic Stacking Chair with Matching Legs ONLY $20.35! Super value-priced chairs have a 25-year limited warranty. These stylish chairs are strong, stable and easy to stack. Ergonomic design promotes correct seating posture. Balance Pods - Set of 4 ONLY $28.95! Balance, coordination and confidence. Use our 6 1/2" Balance Pods with the sensory surface side up and flat side down for beginners, or turn them over for more challenge! Set of 4 in blue, green, red and yellow. Find more Extreme Bargains when you click here. Save over 50% on hundreds of educational supplies for your early education center, classroom or home. But you have to act now! These Extreme Bargains won't last! Don't wait longer for a better deal and miss your chance to save big! 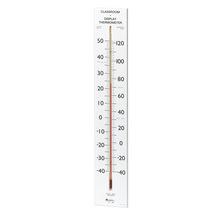 Extreme Bargains at Discount School Supply going on right now...click here to take advantage of these sizzlin' savings! With record heat temperatures in some parts of the country, it's a good time to look for ways to stay cool. Luckily, Discount School Supply has some affordable solutions. Bucket Hats - Set of 12 ONLY $12.97! 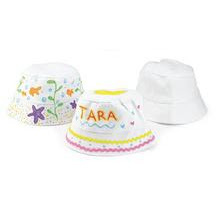 Have fun in the sun with these sturdy white fabric hats. Easy to decorate and cool to wear. Decorate with fabric markers, fabric and puffy paint. Perfect size for children. 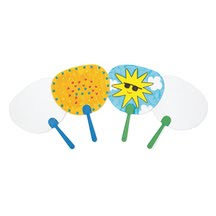 Handy Hand Fans- Set of 12 ONLY $5.99! These hand-held fans are a stylish way to beat the heat. Decorate the sturdy cardboard with markers, crayons, stickers and glitter to match their blue and green plastic handles. You'll have a personalized, warm weather accessory that is lightweight and portable! Cool Colors Colorations® Simply Washable Tempera Paints, 16 oz. - Set of 4 ONLY $6.76! Colorations® Simply Washable Tempera offers the lowest price and best quality on tempera paint - guaranteed! Its smooth, rich consistency, matte finish and opaque coverage make this ultra-washable paint the smart choice for classroom projects. Set includes all 4 cool colors: apple green, cantaloupe, periwinkle and violet. Cool Colors Colorations® Simply Washable Tempera Paints do not contain the following common allergens: latex, dairy, casein, egg, gluten, peanut, tree nut or soy. Moms, dads, teachers and caregivers: beat the heat with cool savings from Discount School Supply today! Find more cool deals on Arts and Crafts, Furniture, Manipulatives, Active Play, Dramatic Play, Curriculum Resources and more exclusively at Discount School Supply. But you must act now! These great deals--just like summer--won't last long! Shop Discount School Supply today to save money on your early education needs. How Low Can You Go? New Price Drops at Discount School Supply! Yes, with the 110% Lowest Price Guarantee, Discount School Supply is the best place to shop for early educational materials. And yes, in addition to the low, low prices, you don't have to sacrifice quality because Discount School Supply features the best brand names in early educational materials. So how can shopping at Discount School Supply get any better? With the New Price Drops, that's how! Save up to 40% or more on top brand name items when you shop the New Price Drops at Discount School Supply right now! Crayola® Dough - 3 lbs. ONLY $8.79! Crayola® Dough is smooth and squeezable that responds easily to small hands. This dough comes in a tub with snug-fitting lid to keep the dough soft and pliable when not in use. Non-toxic, this dough comes in blue, green, orange, red, violet, yellow or the set of all 6 colors. Elmer's® .24 oz. Clear Glue Sticks - Set of 30 ONLY $9.99! These classic washable clear glue sticks from Elmer's® come in a convenient pack for the whole class. White glue sticks glide on white and dry clear. Elmer's® is washable, AP certified, non-toxic, and conforms to ASTM D4236. Soft Tunnel Set by Children's Factory® ONLY $359.99! This set of nine soft shapes with equal sides to nest along features an anti-slip bottom and hook-and-loop fastener strips to allow you to form new combinations. For ages 6 months to 3 years. Find more New Price Drops with up to 40% savings when you click here! But you must hurry! These New Price Drops won't last long! Parents, teachers and caregivers: be sure to remember Discount School Supply the next time you shop for early educational Furniture, Curriculum Resources, Active Play products, Dramatic Play items, Arts & Crafts and more! Top quality products and the 110% Lowest Prices Guaranteed: it's a recipe for customer satisfaction at Discount School Supply! With the 4th of July just around the corner, Discount School Supply is thinking red, white and blue! Big Red Classic Wagon ONLY $169.99! With a classic look and sturdy, all steel construction this wagon is a wonderful childhood companion that is built to last. Features extra-long handle for easy pulling (folds flat for storage), controlled turning radius to prevent tipping, no-pinch ball joint to keep fingers safe and 10" tires. This wagon is easy to assemble and measures 36"L x 17-1/2"W x 6"D.
White Moon Sand® - 20 lb. ONLY $48.99! Moon Sand® is an amazing molding and sensory material! It molds like dough without having to add water, it is clean, and it won't dry out! Incredible! Sculpt it with tools or your fingers, pack into molds, squish and press objects in it for various indented designs. Moon Sand® is perfect for a sensory table or a sand tray. The beach white color sand builds gross and fine motor skills. Your 20 lb. bag will yield a multitude of creations! Funky Sofa - Blue Fabric ONLY $199.99. This customer favorite is built for the "rough and tumble" years of preschool children. The overstuffed sofa features Dura-Care© fabrics ensuring durability and easy care. It is available in blue and red fabrics so please specify when ordering. Sofa measures 38"L x 18"D x 24"H and ships in 14 days. So think red, white and blue and shop Discount School Supply this 4th of July. 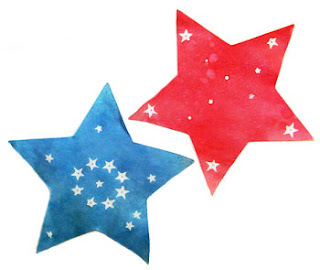 Be sure to stock up on your red, white and blue craft items like construction paper, crayons, markers, glue, paint, crafting kits and more at the 110% lowest prices guaranteed! Moms, dads, teachers and caregivers: Discount School Supply is the best place to shop for all your early education needs. With amazing deals on Arts & Crafts, Furniture, Curriculum Resources, Manipulatives and more, Discount School Supply is bursting with savings. Click here to shop now and enjoy your 4th of July!